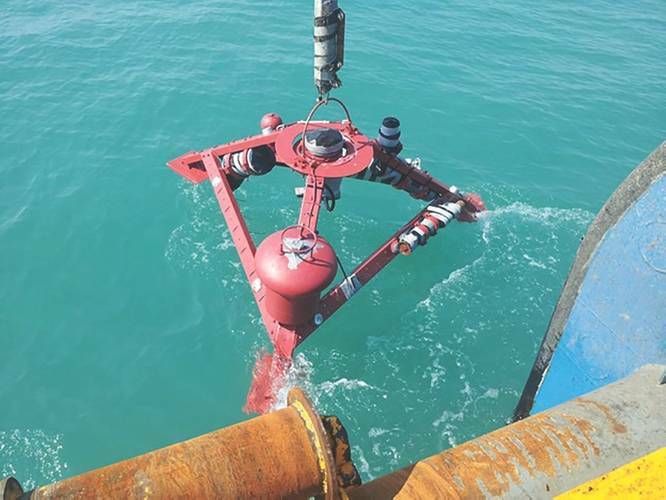 The seafloor tripod installed by AIMS at the entrance to Port Darwin. It carries a 600 kHz Teledyne RDI ADCP equipped with NEMO waves, Teledyne Benthos ATM916 acoustic modem, and a suite of water quality sensors. 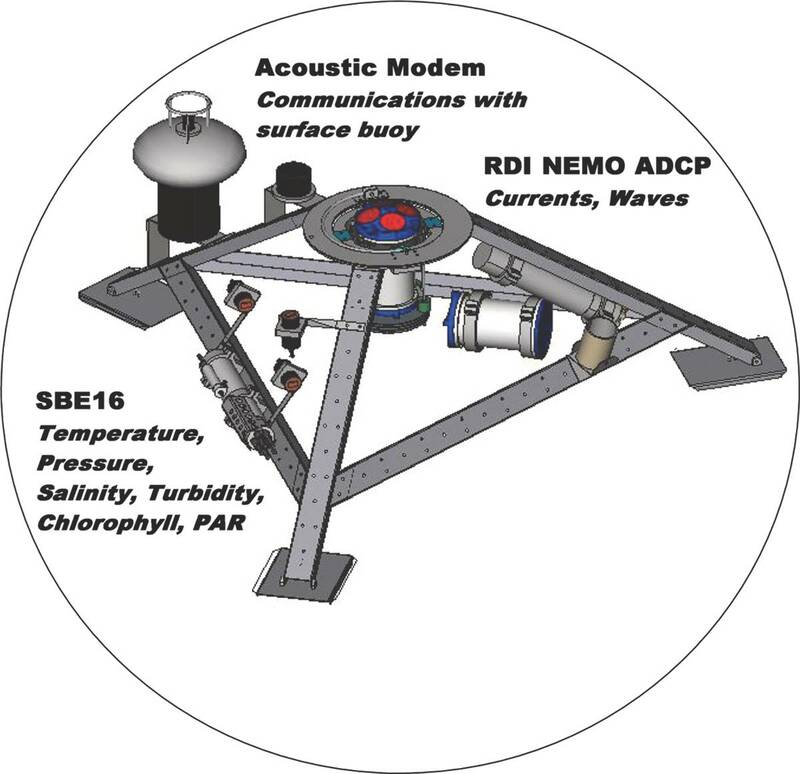 The ADCP simultaneously profiles currents and processes directional wave spectra in-situ. Located in Australia’s northern Top End, the port of Darwin has long been a strategic gateway to/from Asia. 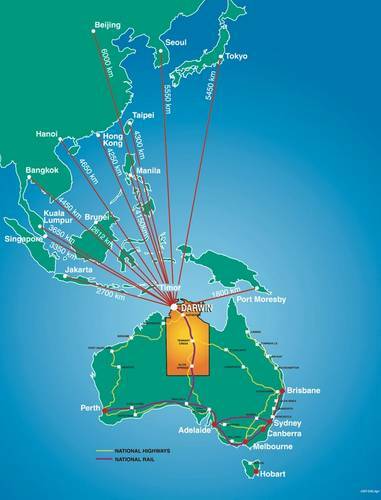 Founded in 1869, today Darwin is a major multi-modal port serving shipping and cargo markets. Ships range from container and general cargo to cruise and naval vessels. Exports include livestock and minerals as well as bulk liquids like LNG. As well, the port provides services for offshore oil and gas rigs. Due to Australia’s increasing trade links with Asian neighbors, the port and facilities have expanded for increased shipping and business. This expansion has seen a renewed focus on the interplay between the port’s operational, maritime and natural environments. For example, a large tidal range of almost 8 m drives strong and complex currents, having speeds to 2 m/s. At times, maneuvering Panamax and LNG bulk carriers can be difficult. While aiding such port operations, marine observing systems can also help reveal processes that impact the sustainable use of these areas (e.g., sediment transport, water quality). To boot, these data can provide ground truth and boundary conditions for computer models used in the port’s development projects. Australia’s Integrated Marine Observing System (IMOS) includes a station at the entrance to Darwin Harbour. Information for currents, tides, waves, temperature, water quality parameters (e.g., Chlorophyll-a, turbidity), wind and rainfall are recorded. More recently, bio-geochemical instruments have been added. Updated every 30 minutes, various data summaries are available via the Internet in near real-time. While navigating ships in Darwin Harbour, pilots can use a smartphone to see the data. As well as supporting safe shipping, these near real-time observations can aid the general public. Examples include recreational activities, improved safety from storm events, protections for public health and healthy ecosystems. For authorities, these data can also assist in emergency response operations and support. The ADCP-based system in Darwin Harbour can have a direct impact on the port’s efficiency and safety. Two parameters can be important for the economics of big ships in a port. One is the sailing window, which is the available time for safe passage. The second is the vessel draft, which limits the amount of cargo carried. Knowing the actual conditions for currents and waves can help operators to maximize these two parameters safely. Entry and exit to ports where shipping channels have bends can be challenging for big ships. Strong and variable water currents worsen the difficulties. Timely data about unpredictable water movements aid pilots navigating ships and berthing at docks. Knowing actual wave conditions can help reduce the possibility of ship groundings. This problem can arise in both along-ship and across-ship directions. For example, large ore carriers have flat bottoms; when rolling, they have less clearance than rounded hulls. Likewise, real-time information about wind loading on ships permits more efficient use of tugs. A less direct effect of water currents on port operations is via transporting sediments. Deposition of sediments drives the need for dredging. For port operations, this affects maintenance intervals. Plus it can require monitoring of how dredge spoils enter the surrounding environment. Currents can move sediments along the bed (e.g., sand waves in navigation channels) or in suspended mode (e.g., river effluent, dredging plumes). At certain times, the entrance to Port Darwin is restricted in depth through an area of sand waves. This restricts passage for Panamax-class ships during lower stages of the tidal cycle. Dredging a channel is planned to permit unfettered access to Port Darwin for big ships. As part of this effort, understanding how water currents move the sand waves will be essential. The marine National Reference Station at Darwin was installed by the Australian Institute of Marine Science (AIMS). The system was engineered by Dr. Paul Rigby of AIMS. 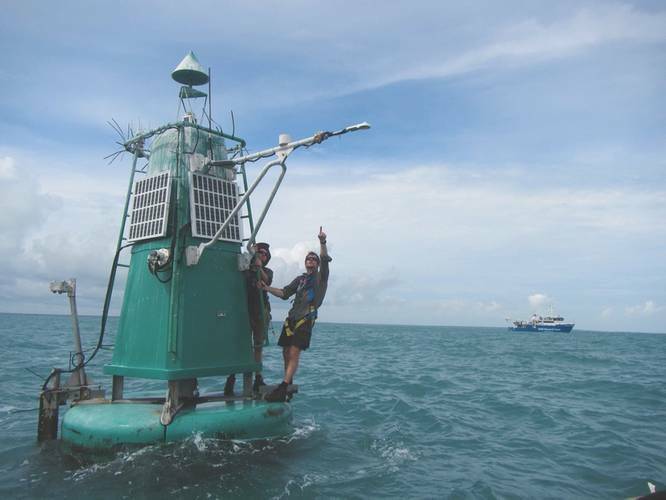 Darwin Port Corporation provided an existing navigation buoy to support the observational instruments. Water motions are profiled with an ADCP-based system at 20 m depth. Recently a second mooring was added in the Beagle Gulf to extend seaward oceanographic observations. Aboard the buoy, instruments are located at two heights. At 3 m are a weather station and radiometer whereas just below sea level are water quality sensors. On the seabed, about 100 m from the buoy, is a tripod. As well as water quality sensors, it carries a 600 kHz Teledyne RDI ADCP equipped with NEMO waves for in-situ processing. The ADCP simultaneously profiles currents and processes directional wave spectra in-situ. 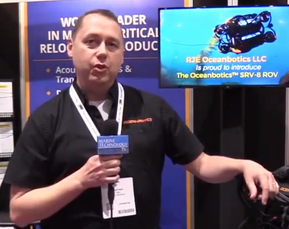 Combining both currents and waves in a single compact package simplifies operations. Using battery power allows the measurement of waves every two hours over a six-month deployment. Using a bottom-mounted ADCP for measuring waves, rather than a surface buoy, can have key advantages. It has been shown that ADCP wave measurements compare favorably with competing techniques. Mounted on the bed, the equipment is safe from damage due to collisions by shipping. Also AIMS avoids frequent maintenance trips to remove fouling by tropical birds. Both had been problems while using wave buoys. Access to the seabed ADCP’s data is achieved using acoustic telemetry through water to the surface buoy. The link is via a Teledyne Benthos ATM916 acoustic modem. Every 30 minutes, the near-surface modem polls the tripod modem. This interval allows for six-month deployments when using battery power for the modem. The communication link from the navigation buoy to shore uses the NextG mobile phone network. Its primary use is the scheduled uploads of new marine data. Yet this link also allows full remote access to the station for software updates and maintenance. For the farther site in Beagle Gulf, real-time communications are via satellite. Besides helping operators understand what is influencing coastal systems, this site serves as an early warning system. It provides alerts of approaching weather to improve forecasts of waves and current at key sites along the shipping channel. All transmitted data are published on the AIMS website. They are publicly accessible within 10-30 minutes of leaving the tripod. The web interface provides tools for exploring and plotting the data. Another simpler interface for smart phones delivers relevant readings to mariners. Every six months, the instruments are recovered. This period is set to avoid bio-fouling issues with other sensors in the collective (e.g., pumps, optics). All raw data stored on each instrument are downloaded. Typically, these sets are more detailed than the real-time stream, which is limited by available bandwidth. The full data set is processed, controlled for quality, and then published on the IMOS Ocean Portal. Key contributions have been made by John Luetchford, Chris Bartlett, Shaun Byrnes and Jonathon Windsor of AIMS. Data from the ADCP show that currents are bi-directional to speeds of 1.5 m/s. Apparent too is a slight seasonal asymmetry in tidal motions. Net flux of sediment loads into Darwin Harbour has been estimated. This was done by coupling ADCP-based discharge measures with suspended sediment concentration (derived from optical instruments and ADCP backscatter data). For some time, this ADCP-based monitoring system has assisted Darwin Port Corporation in different ways. Besides supporting ship handling actions, the ADCP’s data contribute to managing less frequent activities: recurring events like dredging and occasional events like maritime accidents (e.g., ship groundings, oil spills). The data are also valuable for general public uses like recreational boating and trip planning. 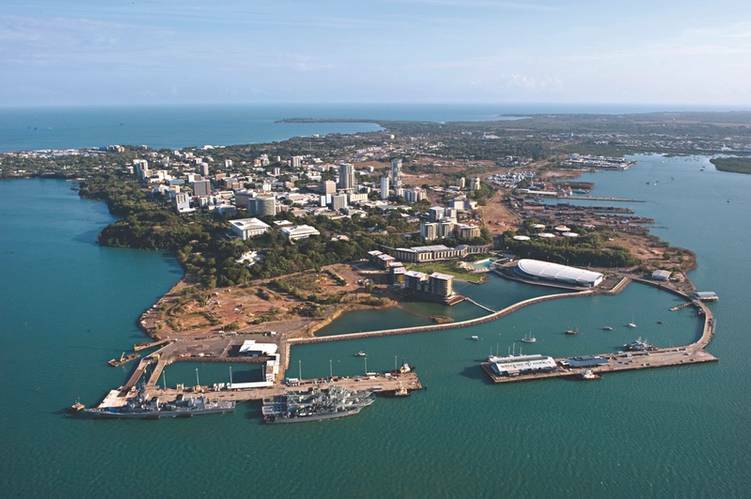 Data from the station are expected to feed into other key systems for Port Darwin. One will include accurate modeling and prediction of under keel clearance. This will help in optimizing the sailing window and maximizing the draft for any particular ship. Another is an operational forecast model for Darwin Harbour.